Liv Bloom’s life is even more complicated than that of your average fourteen-year-old: her father walked out on the family when she was young, her mother is in a recovery centre for alcoholics, and her older sister is struggling to step into Mum’s shoes. The only person she can turn to is her best friend Sarah, who keeps out of scrapes at school and is a constant source of advice and companionship. One day Liv discovers a book of recipes written in her mum’s handwriting, which sets her off on a journey towards self-discovery and reconciliation – but a theft, a love rivalry and a school bully are just some of the many obstacles on the way. 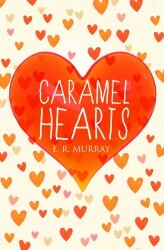 Structured around real cake recipes, Caramel Hearts is a warm-hearted coming-of-age story for 12+ readers about baking cakes, making mistakes, and finding your way home.